Paint, wood, fabric and objects such as sea shells and flowers are easy, alternative ideas for bathroom walls that do not involve actual wallpaper. Fabric with large flowers, for example, will add a focal point to the wall and size down a large bathroom. A border of sea shells glued along the wall will open up a small bathroom. Fabric can be used to cover an entire wall, a portion of a wall or as border trim. Lightweight fabric such as cotton or chintz are easiest to apply. To begin, wash the wall to remove any dirt. Cut fabric, matching any pattern if necessary. Spray starch stiffener at the top of the wall, smooth fabric onto the wall with a sponge. Leave 1 inch of fabric overlapping at windows, doors, floor and ceiling to allow for shrinkage. Keep the fabric in place at the top with pins until dry. Spray starch on the wall as needed until reaching floor level, smoothing on the fabric with a sponge. When the fabric is completely dry, cut off all overlapping areas. Make borders on a wall by gluing shells, glass stones, dried or silk flowers or any small objects that fits the decor of the bathroom. Plan out, measure and mark the design to be implemented. Use a waterproof craft glue to attach the objects to the wall. Use stencils to decorate an entire wall or just a portion. Purchase premade stencils at the craft supply store or make them from wax-coated art paper. Tape the stencil to the wall using painter's tape. Apply the paint to the stencil with a sponge or stippling brush. Peel up the stencil, wipe it clean and repeat the process in the chosen pattern. 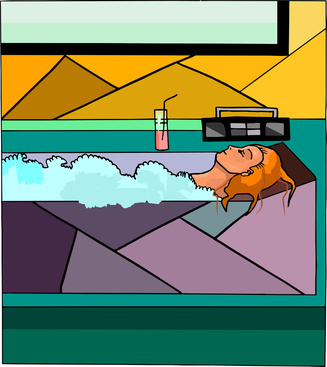 Form a collage of pictures to create a wallpaper-like design for the bathroom. Cover the desired area of the wall with as many pictures as necessary from magazines, old photos or drawings. Apply a thin layer of collage glue to the wall. Arrange the pictures on the glue in an overlapping, layered fashion, leaving no exposed wall between them. When the glue is dry, apply acrylic sealer to the wall to keep out moisture.